Serve with a side of homemade bread! I was looking the other day for a delicious soup recipe online and came across this one because it sounded delicious. 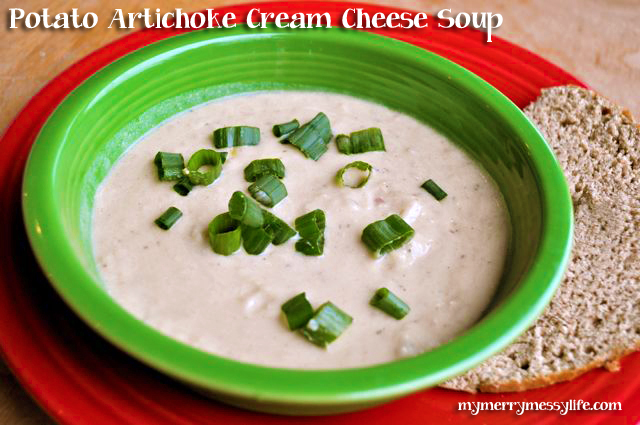 My husband loves soups, but I hardly ever make them because I’m not much of a soup person. But this soup? It’ll make anyone a soup person because it is THAT good! 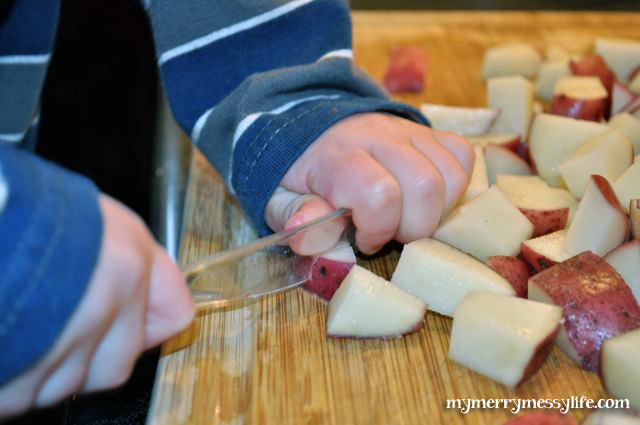 And, it’s fairly simple to make, about 45 minutes or less to prepare and cook, unless you have a toddler helping you with a cranky, teething baby crawling around wanting some attention! As you can imagine, it took me about an hour and a half to put together, but close to two and a half after cooking the bread! Whew! I got the recipe off of cooks.com and it is a keeper, especially on cold, icy days like yesterday was. Here are the ingredients you need: potatoes, scallions, garlic, chicken stock, artichoke hearts (canned or frozen), salt and pepper. 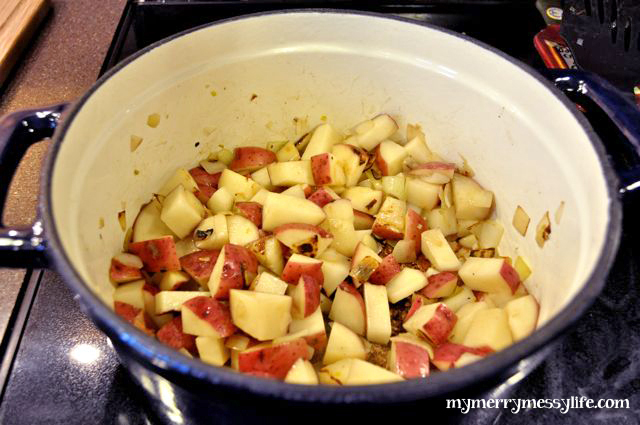 Pot or Dutch Oven: I used a dutch oven, but a simple pot will do just fine. 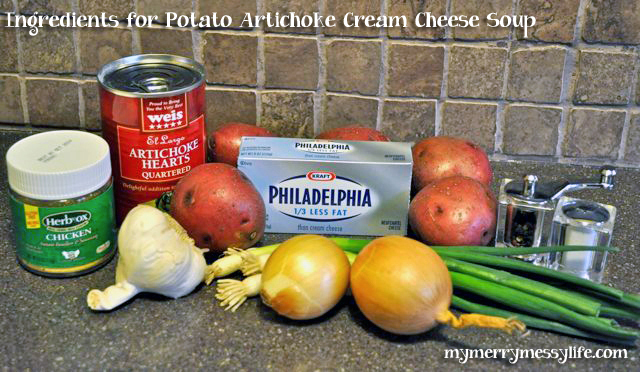 The recipe calls for cream cheese, but I used Neufchatel cheese – it’s 1/3 less fat than cream cheese. I wanted it to be healthier. I thought the recipe needed more flavor, so I added thyme leaves, 2 bay leaves, poultry seasoning, and a healthy serving of pepper. I’m a big fan of paprika, so I might add that next time. 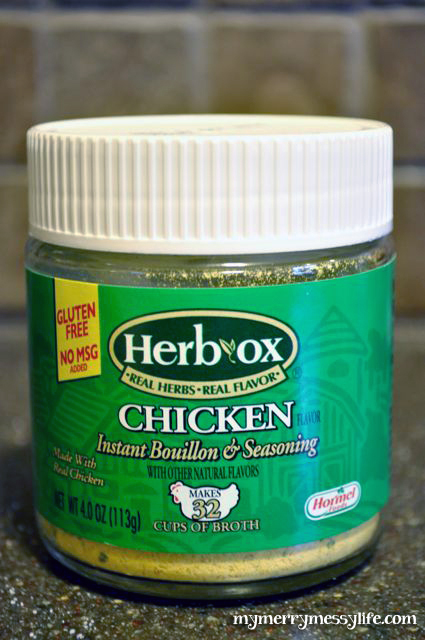 The recipe calls for chicken stock, so I make my own chicken stock with Herbox chicken bouillon in powdered form. This little bottle makes 32 cups of stock and costs $2.29, compared to buying a 32 oz. box of chicken stock from Wegman’s (that’s only 4 cups) for $2.99. That’s a HUGE cost savings! You’re basically paying for water when you buy boxed chicken stock. I heat the amount of water I need in a pan, bring it a boil, then spoon in the correct amount of bouillon. More effort, but it saves lots of money. Here’s the soup before adding the stock and blending it. The whole house smelled of caramelized onions, garlic and potatoes. YUM! This soup gets two thumbs up from my husband. It is absolutely delicious and really hits the spot when it’s cold and damp outside. After all the ingredients have cooked for 20 minutes (mine took longer before the potatoes were done – about 35 minutes), then you grind the soup in a blender (1/2 the mixture at a time). 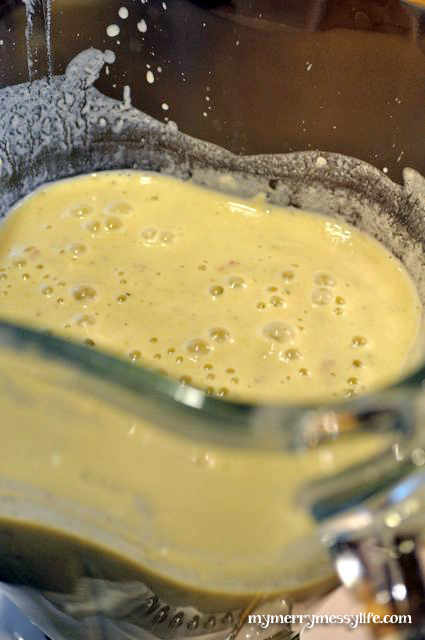 After blending, the soup was frothy and creamy and MMM MMM good! 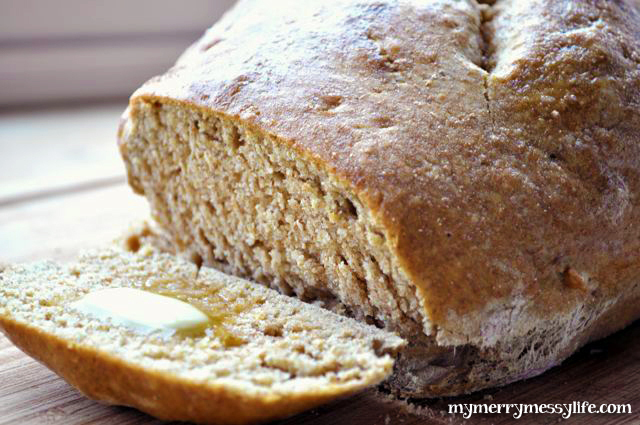 I must’ve had a lot of coffee yesterday morning because I didn’t stop at making the soup – I kept on going and made whole wheat, no yeast bread, too! I regretted it later when the kids were cranky and my back was hurting…until it came out of the oven! So tasty and hearty.